Important Disclaimer: This is an accelerated cycling test at elevated temperatures and with high charge and discharge rates. Although these cells didn’t meet their rated number of cycles in this test, that doesn’t mean that they’re overrated – under cooler temperatures and at more moderate charge and discharge rates, it’s reasonable to expect Eneloops to maintain better performance for a lot more cycles. Only one 1st and one 4th generation Eneloop have been used in this test. It’s likely that repeated testing would give somewhat different results due to variations in individual cells, however I wouldn’t expect the difference to be too significant since Eneloops tend to be quite consistent when comparing different cells. The IEC standard for measuring cycle life on NiMH cells involves only a partial discharge for most cycles as well as charging and discharging at lower rates. It should be no surprise that the abuse that these cells were subjected to in this test led to them working for significantly less cycles than they were rated for! It appears that the 4th generation Eneloops do indeed perform much better than the 1st generation Eneloops. 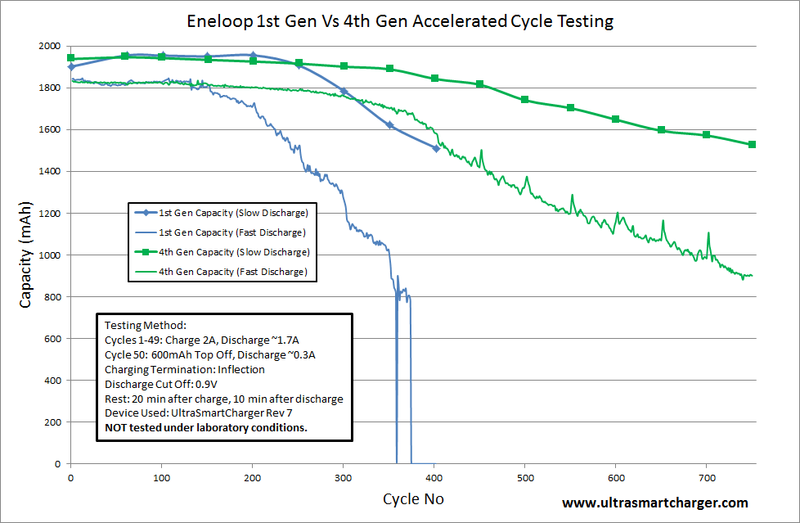 The 1st generation Eneloop started to lose performance in this test at around the 150 cycle mark, although this degradation in performance didn’t appear during the slow discharge tests until the 250th cycle. In contrast, the 4th generation Eneloop was performing almost like new up until about the 250th cycle. After 350 cycles each, the 4th generation cell was able to provide more capacity and energy at a high rate than the 1st generation cell was able to provide at a low discharge rate. Testing is still ongoing, but the 1st generation cell is already pretty much unusable for high current loads, whilst the 4th generation cell is still working quite well and appears to be degrading at a slower rate than the 1st generation cell did. I expect that it will probably give more than twice as many usable cycles as the 1st generation cell did. In this test at least, the 4th generation Eneloop has performed significantly better than the 1st generation Eneloop. Although it’s possible that the 4th generation only performed better because it was more recently made, I don’t think that is a significant factor. In the process of designing the Eneloop to have low self discharge, I think Sanyo has also managed to basically solve problem of permanent degradation of the cell over time when it’s not being used. After a few charge/discharge cycles, the 1st generation Eneloop was actually giving slightly higher capacity figures than the 4th generation Eneloop and continued to do so until it started to degrade at around 150 cycles. This test doesn't accurately reflect the results that can be expected by following the IEC NiMH Cycle Testing procedure. My best guess would be that option 4 is the most likely, but I don't have enough evidence to confirm whether this is actually true or not. 1st generation Eneloops are generally not available for sale anymore, however they still perform very well considering their age. If they were still available at the same price, the obvious choice would be to buy the 4th generation Eneloop, however if they were significantly cheaper, the 1st generation cells would still be a good choice in my opinion. 4th generation Eneloops are at the time of writing this only available in Japan which makes them difficult and expensive to obtain in other parts of the world. Although this test doesn’t provide any results for the 2nd and 3rd generation Eneloops, I would expect that their performance would be significantly closer to the 4th generation results, so I wouldn’t hesitate to continue purchasing either 2nd or 3rd generation Eneloops whilst waiting for 4th generation cells to become more widely available. In this test, temperature wasn’t controlled. Higher temperatures are likely to give better performance in the short term, but will likely cause the cells to degrade faster over the longer term. In this test, discharge current was not at a set current, but just into a resistor and so decreased as the cells discharged. Average current in this test was therefore lower – leading to higher capacity results. The discharge cut off point in this test was set to 0.9V whereas the other testing was done with a 1.0V cut off. Initially, this wouldn’t have made much difference, but as the cells degraded, the lower cut off value would significantly improve the measured results. The charge termination method in this test was the inflection method – this causes a slight undercharge on the cells, but should be much kinder on them than the –dV with -10mV termination used in the other test. I was hoping that this would lead to longer cycle life, but I suspect that the elevated temperatures for the rest of the testing more than negated this benefit. 1st generation Eneloop was manufactured in October 2006. 4th generation Eneloop was manufactured in June 2013. Charger was configured to do 49 cycles of charging at 2amps and discharging into an external 0.47 ohm resistor. Combined with the 0.1 ohm current sensing resistor, FET resistance and also contact resistance of the external load connectors, discharge current averaged at around 1.7 amps. For the 50th cycle, the charger was set to do a normal fast charge at 2 amps followed by a 600 mAh top off at 200 mA and then discharged into the internal 3.9 ohm resistor. Average current for this last test was about 300 mA. Rest periods were 20 minutes after charging and 10 minutes after discharging. After every 50 cycles, the charger was turned off and the SD card removed to download the collected data. Environment: This testing was NOT done under laboratory conditions. Ambient temperature was often above 25 degrees Celsius with a number of days getting into the mid to high 30’s. The charger was also poorly located on top of a laptop which was also generating heat of its own – the lid of the laptop was generally 4 to 6 degrees above the ambient room temperature. Compare a 2nd generation cell to another 4th generation cell. Better location – away from the laptop that is running the test. Forced air cooling to help keep the cells even cooler. Discharging into constant current sinks at 2amps. I’m also planning to do further testing to compare the cycle life of Eneloops with other brands of low self discharge cells. I've just updated the chart to show results up to cycle 450. The 1st generation Eneloop is no longer able to hold sufficient voltage under load for it to handle the fast discharges. At cycle 359, it was only able to provide a few mAh before the voltage fell below 0.9V. Cycles on either side, the cell was a bit warmer and managed to hold the voltage a bit higher - the act of discharging the cell caused the cell to heat up, lowering the internal resistance and the voltage actually recovered somewhat before finally dropping again. After 375 cycles, the internal resistance of the 1st Generation cell had risen so high that even when it was warm, it was no longer able to maintain enough voltage for the discharge to start, causing the charger to record a zero capacity from that point onwards. It may appear that the degradation of the slow discharge performance has slowed down at cycle 400, but it should be kept in mind that the cell hasn't gone through 400 full cycles at that point, so that result should really be shown as cycle 375. I've now retired the 1st gen cell from this test and it's now sitting unused - I'm planning to discharge it after it has been sitting idle for 30 days to see if the low self discharge properties are still present. The 4th generation cell is now losing performance quicker than I previously thought, so I've adjusted my conclusions accordingly. Another update - the 4th generation Eneloop is now up to 500 cycles. Performance is still dropping off quite quickly and I'd expect it to continue to do so, but I'd estimate that it should still manage another 100 cycles or so. After 750 cycles the 4th generation cell is also no longer able to hold its voltage under load for long enough to start the fast discharge, so I'm now calling this test complete. I'm planning to run another test, but with the charger in a cooler location with cooler weather (and possibly a fan to ensure the cells stay cool), into an external constant current load, and probably between a 2nd gen cell and the 4th gen cell again. If anyone has any suggestions for other changes, please let me know ASAP!